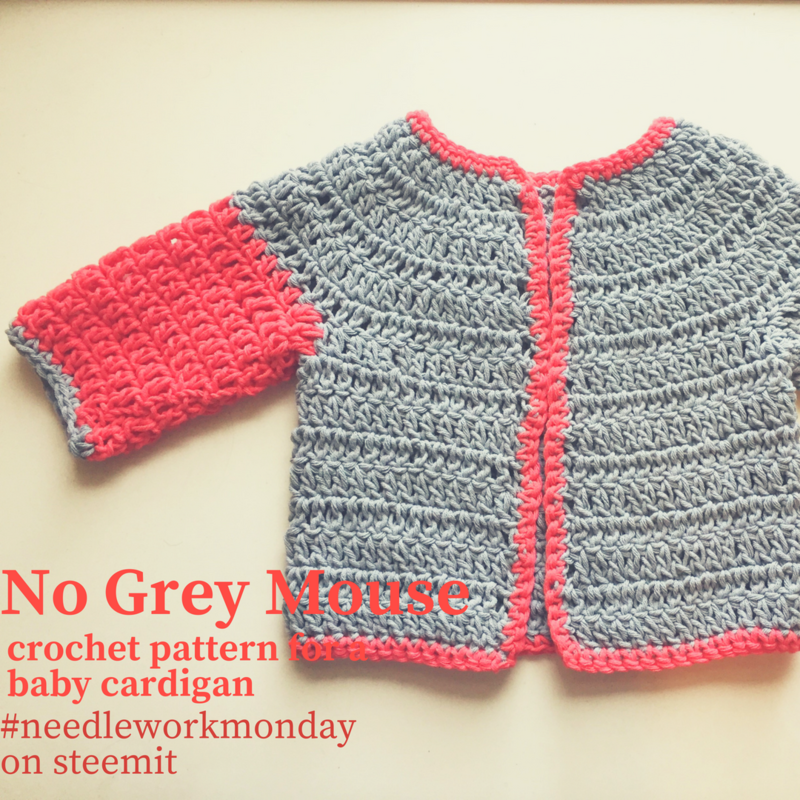 Finally … may I present you the little No Grey Mouse baby cardigan? An easy top-down crochet pattern. Do you remember that I showed you a photo of this little Baby cardigan and asked if you would like the pattern and you said yes? As I gifted this cardigan to a good friend I had to stall time, because my notes were not complete, and I no longer had the cardigan with me to check my inconsistent notes. Therefore, the lengthy posts in the last weeks about how to knit or crochet a cardigan. But as you perhaps already guessed because of my evasive and long introduction: I still do not have this cardigan back and my notes are still – ahem – not optimal. Nevertheless, I decided to publish this pattern and ask for your help and lust for adventure. My idea is, I give you my notes and you could perhaps tell me, if there are mistakes in my pattern. (Maybe you remember that I currently cannot crochet because my fingers instantly hurt). 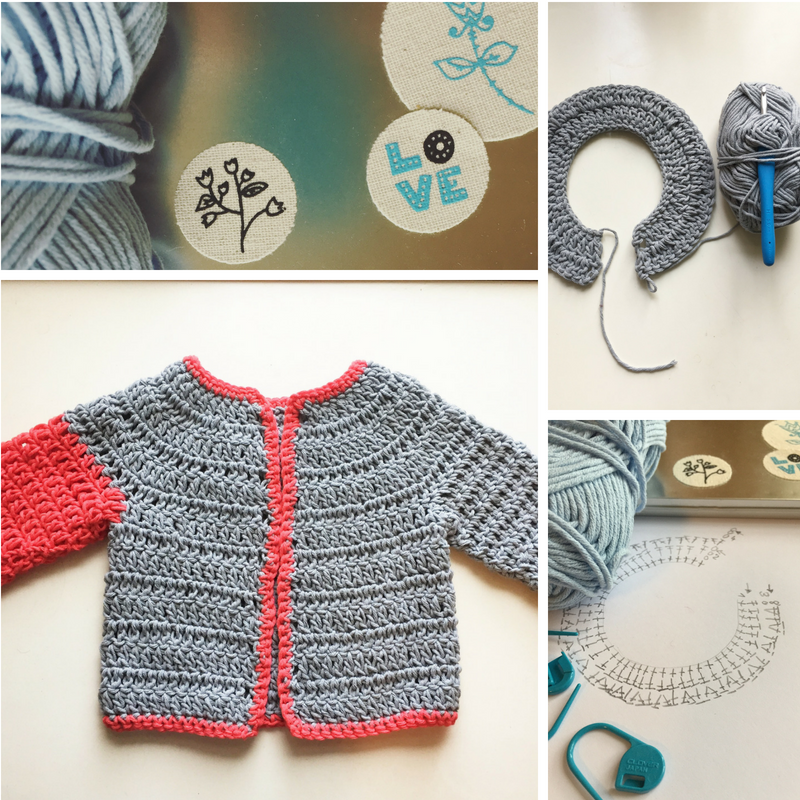 The cardigan is crocheted top-down with a round yoke. When you reach the desired yoke length, sleeves and body are separated. First you crochet the body and afterwards the sleeves. 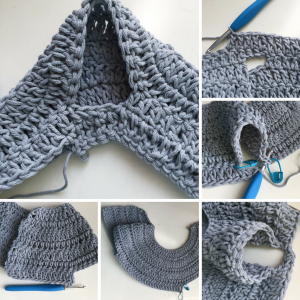 The final touch is a border in single crochet in a contrast color. As I have written above, I currently do not have this jacket at home and sadly (I am soooo sorrryyyy) I did not write down the size and the stitches. I asked my friend to measure her jacket, but it is worn and washed several times. So, beware that the size might not be super exact. 11 stitches and 10 rows are 10 x 10 cm. Width 28 cm and length 30 cm. The ch 3 at the beginning of the row counts as dc throughout. 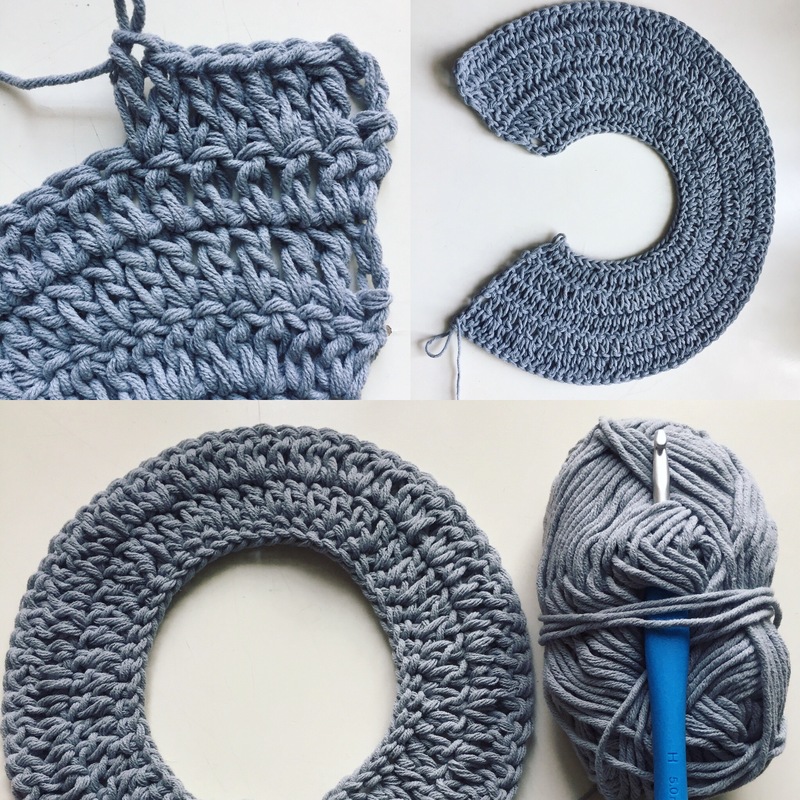 Remember to skip the first stitch directly below the turning chains. Only to increase a dc at the beginning of the row you must work in this first stitch. To make a wider and longer cardigan, simply go on and increase every third row 23 stitches. The yoke will be separated into 14 st for the left front, 18 st for the left sleeve (plus 4 fsc), 28 st for the back, 18 st for the right sleeve (plus 4 fsc), 14 st for the right front. Row 1: 3 ch, distribute 23 dc evenly around armhole, ss into turning ch and close to round. (24 dc) Two dc are worked into the legs of stiches, therefore the 24 st. 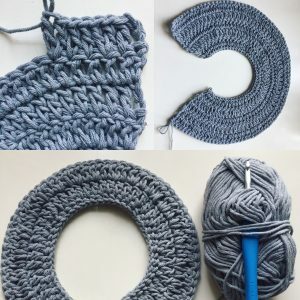 The instructions for the second sleeve are essentially the same, only I used the red yarn for the sleeve and the grey for the last row of single crochet. 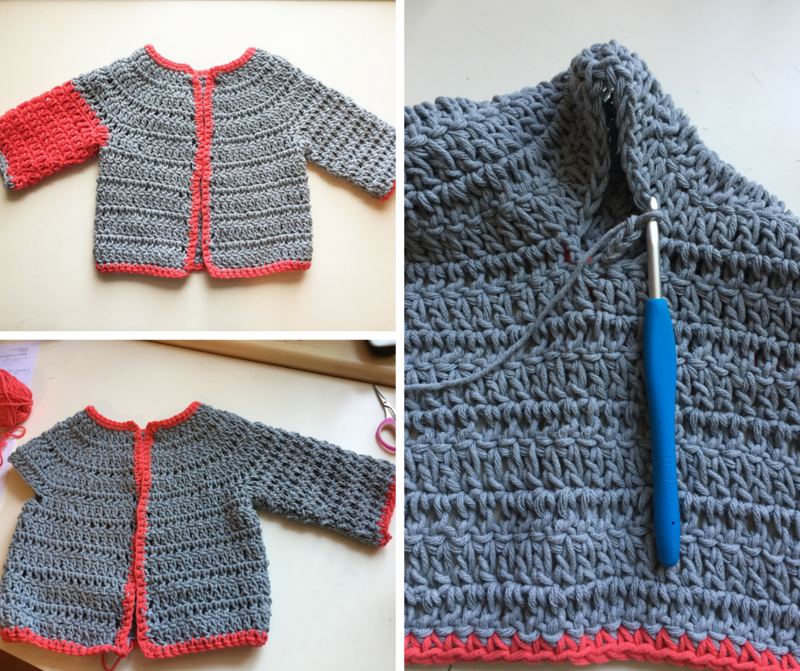 To add a splash of color I crocheted in a contrast color around the complete cardigan. I used single crochet for this border (one stitch in every stitch, but two into the corners! ).